Outgoing, unstoppable communications, mass media and journalism major. Known as a quick learner with the proven ability to size up people and situations quickly. Determined to be a broadcaster, journalist, reporter and radio host. Love sharing stories – and being a part of the story – with people from around the world. Active in the Kennesaw State University student media. Recognized as a class leader. Served as a reporter for the weekly student newspaper last year and will continue working this year. Broad multicultural experience. International travels include Canada, Spain, Italy and France. Fluent in Spanish as well as English – lived nine years in Mexico. – Rising sophomore; freshman curriculum included Human Communication and Public Speaking. – One of twelve students, out of 200 eligible, to receive a certificate for leadership in the Human Communications class. – Serving as a reporter on the student newspaper, the KSU Sentinel: www.ksusentinel.com. – Member of the Thrive community – a club for leaders who want to help others. – Throughout the year we went around helping with the community, such as going to the Carrie Steele-Pitts Home in Atlanta and mentoring kids (K-12) who needed role models. – One project at the Carrie Steele-Pitts Home included the production of a video about the history of the home. It included on-camera interviews with the manager of the home. – Co-host of a live radio broadcast every Saturday called "Community Talk with Ezell and Fernanda." We talk about education, news, and other important matters for refugees that come from countries such as Ethiopia and Somalia. – Also works as a reporter for Sagal Radio. Reported in a mayoral election of the City of Clarkston and got to ask the candidates questions as well as report on their answers. – Was the host and moderator for the 2013 Clarkston mayoral debate. – In the process of shooting a documentary for Sagal Radio that will require for me to research, write, edit, shoot, and interview different people. – Worked for The Sentinel (Newspaper of Kennesaw State) last year, and will be working for the newspaper again this year, writing an article a week. – Interviewed many different people from singers that wrote their own music to the director of marketing at CNN en Español. – served as a reporter for the lecture given by the president of Ghana, John Dramani Mahama,and had the opportunity in asking the president a question at the press conference. – helped write an article about the president's visit to KSU; it made the front cover of The Sentinel. 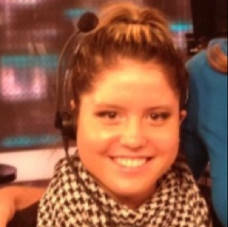 – As an Intern at CNN, working behind-the-scenes to put the news on the air. Met many anchors working here such as Brooke Baldwin, Isha Sesay, Gabriela Frias, Carlos Montero, and Sanjay Gupta. – Assisted with short videos of the anchors talking about what to expect on their show. – Translated stories and helped develop ads for the company. – Had the opportunity in writing, editing, and shooting a short video about my Intern story. – Shadowed in Brooke Baldwin's Show.